Attitudes are evaluations of people, places, things, and ideas. They help us to navigate through a complex world. They provide guidance for decisions about which products to buy, how to travel to work, or where to go on vacation. They color our perceptions of others. Carefully crafted interventions can change attitudes and behavior. Yet attitudes, beliefs, and behavior are often formed and changed in casual social exchanges. The mere perception that other people—say, rich people— favor something may be sufficient to make another person favor it. People’s own actions also influence their attitudes, such that they adjust to be more supportive of the actions. People’s belief systems even change to align with and support their preferences, which at its extreme is a form of denial for which people lack awareness. 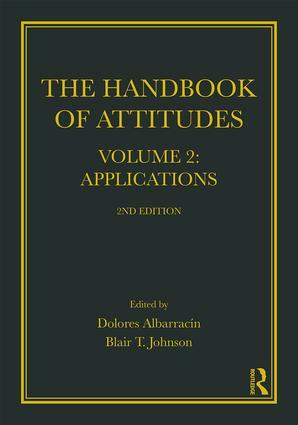 These two volumes of The Handbook of Attitudes provide authoritative, critical surveys of theory and research about attitudes, beliefs, persuasion, and behavior from key authors in these areas. This second volume covers applications to measurement, behavior prediction, and interventions in the areas of cancer, HIV, substance use, diet, and exercise, as well as in politics, intergroup relations, aggression, migrations, advertising, accounting, education, and the environment. I. Health. The Role of Attitudes in Cancer, Kate Sweeny & Kyla Rankin. The Role of Attitudes in the Use of Tobacco, Alcohol, and Cannabis, Benjamin X. White, Man-pui Sally Chan, Angelita Repetto, Stefanie Gratale, Joseph N. Cappella, & Dolores Albarracín. The Role of Attitudes in Diet, Eating, and Body Weight, Jutta Mata, Mattea Dallacker, Tobias Vogel, & Ralph Hertwig. The Role of Attitudes in Physical Inactivity, Martin S. Hagger. The Role of Attitudes in HIV Prevention, Testing, and Treatment, Laura R. Glasman & Lori A. J. Scott-Sheldon. Doing Harm to Some: Patient and Provider Attitudes and Healthcare Disparities, Louis A. Penner, John F. Dovidio, Mark A. Manning, Terrance L. Albrecht, & Michelle van Ryn. II. Business and Work Contexts Job Attitudes, Daniel A. Newman & Kathleen A. Yearick. The Role of Attitudes in Financial Audits and Directions for Future Research, Christine J. Nolder, Kathryn Kadous, and Mark E. Peecher. The Role of Attitudes in Advertising, Derek D. Rucker & Sharlene He. III. Safety The Role of Attitudes in Violence and Aggression, Kevin L. Blankenship, Johnie J. Allen, Kelly A. Kane, & Craig A. Anderson. The Role of Attitudes in Environmental Issues, Taciano L. Milfont & P. Wesley Schultz. IV. Intergroup Relations, Social Structure, & Politics Social Class and Political Attitudes in the 21st Century, Jeff Manza and Ned Crowly. The Role of Attitudes in Gender, Amanda B. Diekman and Peter Glick. The Role of Attitudes in Intergroup Relations, Jack F. Dovidio, Fabrian M. H. Schellhaas, & Alan R. Pearson. The Role of Attitudes in Migration, Victoria M. Esses, Leah K. Hamilton, & Danielle Gaucher. Political Attitudes, Chadly Stern & Peter Ondish. V. Education, Leisure, and Family Student Attitudes and Academic Achievement: Antecedents and Consequences, Tim Urdan & Amando Argueta-Vogel. The Role of Attitudes in Choice of Travel, Satisfaction with Travel, and Change to Sustainable Travel, Tommy Gärling, Sebastian Bamberg, & Margareta Friman. VI. Summation Application of Attitude Research across Domains: Current State of Knowledge and Future Directions, Kristine Nolder & Kevin Blankenship. Dolores Albarracín is Professor of Psychology and Business at the University of Illinois at Urbana-Champaign. She is a prolific, award-winning expert in the study of attitudes, communication, and behavior. Blair T. Johnson is Board of Trustees Distinguished Professor in the University of Connecticut’s Department of Psychological Sciences. He is an award-winning scholar in the areas of attitudes, social influence, health, and research methods.